In the past half century, we have moved from criminalization of abortion to legalization, although unequal access to services and violent protests continue to tear American society apart. In this provocative volume, a passionate and diverse group of abortion rights proponents—journalists, scholars, activists, lawyers, physicians, and philosophers—chronicles the evolution of one of the most intensely debated issues of our time. 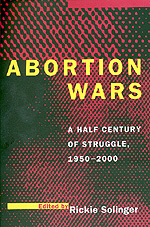 Unique in its attention to so many aspects of the debate, Abortion Wars places key issues such as medical practice, activism, legal strategies, and the meaning of choice in the deeply complex historical context of the past half-century. Taking the reader into the trenches of the battle over abortion rights, the contributors zero in on the key moments and turning points of this ongoing war. Rickie Solinger and Laura Kaplan discuss the covert history of abortion before Roe v. Wade, including the activities of the abortion providers called Jane. Faye Ginsburg examines the recent rise of anti-abortion militancy and its ties to the religious right. Jane Hodgson reflects on her career as a physician and abortion practitioner before abortion was legal, and Alison Jaggar explores the changing theoretical underpinnings of abortion rights activism. Other essays stress the need to redefine the reproductive rights movement so that race and class as well as gender considerations are at its core and raise questions regarding abortion rights for poor women and women of color. Taken together, the historical and interdisciplinary perspectives collected here yield a complex picture of what has been at stake in abortion politics during the past fifty years. The essays clarify why so many women consider abortion crucial to their lives and why opposition to abortion rights has become so violent today. The essays illuminate a fundamental lesson about the nature of social change in the United States: that judicial decisions that overturn restrictive laws and establish new rights do not settle social policy and, in fact, are likely to spark severe and long-lasting resistance. Rickie Solinger is the author of The Abortionist: A Woman Against the Law (California, 1996) and Wake Up Little Susie: Single Pregnancy and Race before Roe v. Wade (1992).